Vortex expands their line of next generation Razor HD riflescopes with the introduction of the 4.5-27×56 and 3-18×50 varieties. These new scopes are designed for precision long-range shooting while the already available Vortex Razor HD Gen II 1-6×24 rifle scope is designed for tactical situations. The new scopes are built for long range shots and offer unprecedented accuracy. They provide the new L-Tec Turret System which has a built in locking mechanism to prevent accidental elevation adjustments. The turrets have clear markings which make it easy to read the elevation and windage adjustments. The adjustments provide infinite position settings to allow zero to be set between clicks. This provides optimal accuracy and precision. A hard stop is provided through the zero stop mechanism which allows to return to the accurate position after dialing temporary elevation changes. The turrets offer visual as well as tactile rotation indicators which help the shooter to keep track of the turns easily. 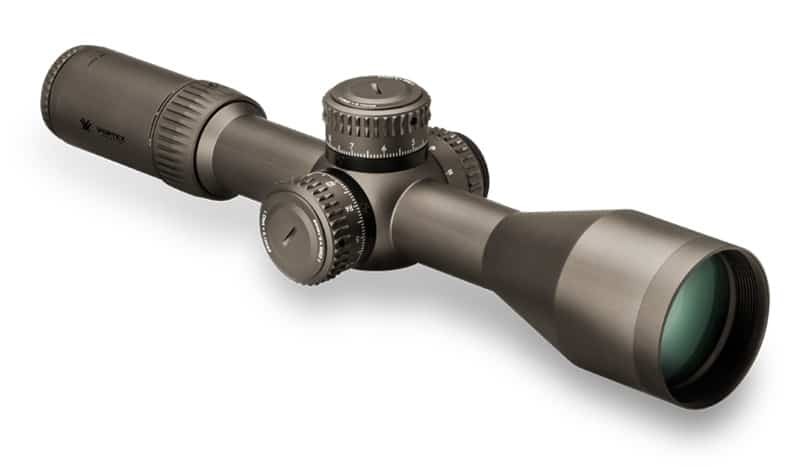 All Razor HD Gen II scopes are machined from a single solid block of aircraft-grade aluminum. The newly announced scopes offer a tube diameter 34 mm. The lens is up to 56 mm in diameter which provides a large area for light to fall in to enhance the image. The lens system is based on the Vortex APO (apochromatic) system which uses lenses that are index matched for color-correction throughout the visible spectrum. The glass used for the lenses is premium high density (HD) glass with extremely low dispersion. This results in the best available resolution and color fidelity providing an impeccable image to the shooter. The lenses are coated with Vortex’ XRPlus proprietary coatings. This delivers outstanding levels of light transmission for optimum brightness. The outside glasses of the lens system are also coated with multiple anti-reflective layers. The scope uses O-rings to prevent moisture, dust or any other environmental hazards to penetrate into the tube and optical system. This ensures reliable performance in all weather conditions. The scope is also purged with Argon gas to prevent fogging throughout a wide range of temperatures. The two additional Vortex Razor HD Gen II rifle scopes will be available in the Summer of 2014. They are outstanding long-range scopes for the professional shooter and certainly worth the wait! 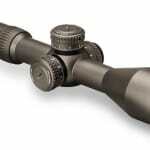 Check out our other rifle scope reviews in case you don’t want to wait until the new Vortex scopes are available.